Multifunction card. Since the current version of TIP does handshaking I decided to run at 9600 baud. What this entails is generating a machine language driver that bypasses the CPS firmware and communicates directly with the 2651 PCI. The program was not all that hard but there were three things that tripped me up. I will transmit the source code separately. 1. The reset message in the TIP-MO3 does not do any handshaking. This caused me problems because I was initially bringing in characters one at a time. This is fine until you reach the bottom of the screen and start to scroll. I lost most of the message when I reached the bottom. The solution is to use a buffer and when there is a break output to the screen. 2. As you are probably aware of the Apple does not normally display lowercase characters. For some reason I completely forgot about the possibility of of having to input lowercase characters I was able to input and display the reset message but the handshaking didn't seem to work. At the same time I was receiving the Beacon consistently but the message was garbled or at least part was and part was fine. The solution was to test- for lower case and then convert to uppercase. 3. Lastly the' way to input the special character 1E hex from the apple keyboard is with a CTRL-SHFT-N. I was making the mistake of thinking that it was just a CTRL-N. I am continuing to work on the terminal program. I will transmit to you in a separate file the current version. It does the terminal interface that is transmitting of characters from the keyboard and the receiving and displaying of characters to the screen. I am setting it up so that the terminal program will be in memory along with a screen editor (Apple Pie). 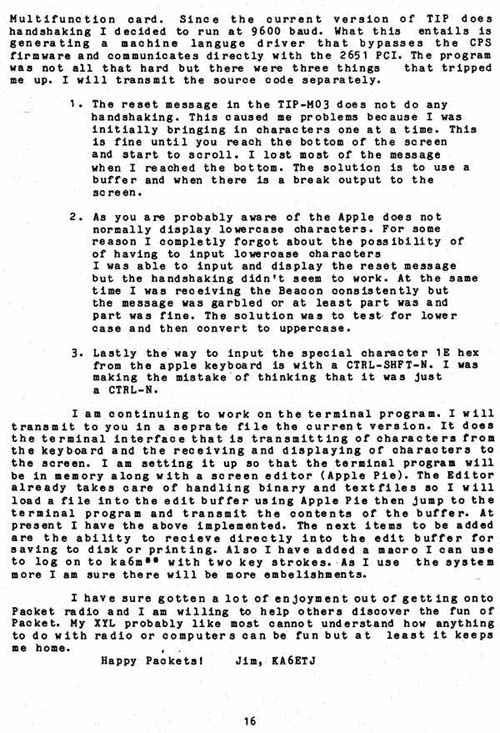 The Editor already takes care of handling binary and text files so I will load a file into the edit buffer using Apple Pie then jump to the terminal program and transmit the contents of the buffer. At present I have the above implemented. The next items to be added are the ability to receive directly into the edit buffer for saving to disk or printing. Also I have added a macro I can use to log on to ka6m** with two key strokes. As I use the system more I am sure there will be more embellishments. I have sure gotten a lot of enjoyment out of getting onto Packet radio and I am willing to help others discover the fun of Packet. My XYL probably like most cannot understand how anything to do with radio or computers can be fun but at least it keeps me home.